The Food Printer from XYZ Printing will cost $1,800. A 3D printer that layers cookie dough instead of plastic will go on sale in Asia next year and later in the U.S. and Europe pending regulatory approval. 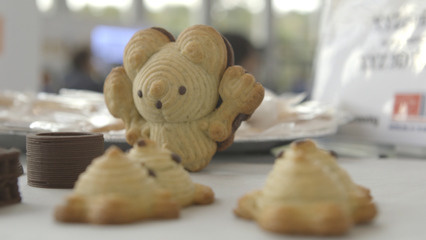 Cookies printed using a 3D food printer on September 3, 2015. 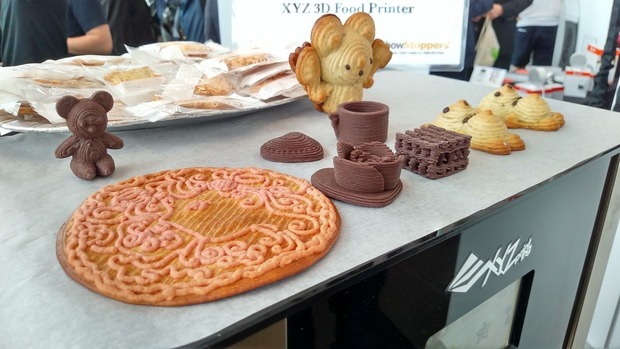 The Food Printer from Taiwan's XYZ Printing will cost around US$1,800. The printer works in a similar way to a traditional printer by layering dough, but what it prints isn't edible. It's printed on a piece of parchment paper and then needs to be baked in an oven before being eaten. The machine can accommodate up to three tubes of printing product. They can be filled with a cookie dough-like mixture, chocolate or supplies to print a pizza. In that case the tubes would be filled with pizza dough, tomato sauce and cheese sauce. The unit has about two dozen preset designs, but bakers can add more via a USB port. The developers are targeting commercial users instead of consumers first and said they need to see where the most demand is.